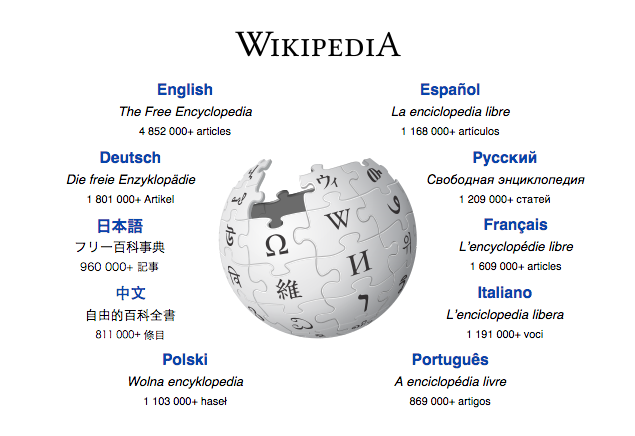 Wikipedia comes in many different languages. The English one came first, but on May 20, 2001, the encyclopedia spread to more than a dozen more languages, including Japanese, German, Hebrew, and of particular note, Russian. The Russian one began on the wrong foot; the first entry created read simply “Россия — великая страна” or “Russia is a great nation,” but that was quickly changed to “Россия — родина слонов (ушастых, повышенной проходимости — см. мамонт)” — “Russia is the motherland of elephants (big-eared, improved cross-country capability, see Mammoth).” But despite these inauspicious beginnings, the Russian version of the digital encyclopedia is very strong, with over 1.2 million different entries as of this writing. Unfortunately, the alt-Wikipedia probably isn’t just an innocent attempt to create a resource for Russian citizens. In recent years, Russia has taken various steps to curb use of the Internet. In early 2014, Putin’s government ordered Internet Service Providers to block access to websites run by opposition groups, and around the same time, Putin asserted that the Internet itself was a special project of the CIA. Further, Russia requires that bloggers with more than 3,000 followers “must register with the Moscow’s mass media regulatory agency and conform to rules applied to larger media outlets,” according to Reuters. Some critics of Russia’s official digital encyclopedia, therefore, believe that the goal of the project isn’t to build an alternative to Wikipedia, but replacement. Bonus Fact: In June of 2004, Wikipedia expanded into another language, one not seen on this planet: Klingon. The Klingon Wikipedia, or “tlhIngan Hol” in its native tongue, ran into problems shortly thereafter. A Wikimedia (the parent organization of Wikipedia) page about the project notes that the encyclopedia “never attracted a community, in part because the fictional origin of the language means that there are no real-world speakers in existence who could form a community,” and that “work was limited by the fact that the Klingon vocabulary is closed and incomplete, leaving no way to discuss many important topics without circumlocutions.” Wikimedia shut down the project in August of 2005. A year and a half later, the site found a new home, here. Take the Quiz! : The Most Popular Countries on Wikipedia (in 2009, at least). From the Archives: Wikipedia Can’t Decide on Wikipedia Founder’s Birthday: True when I wrote it, but now, a decision has been made. Related: “The Wikipedia Revolution: How a Bunch of Nobodies Created the World’s Greatest Encyclopedia” by Andrew Lih. 4.3 stars on 21 reviews.